Shane Shirley : How Can I tell if my Plastics are Safe or Full of BPA...and What About Canned Food? How Can I tell if my Plastics are Safe or Full of BPA...and What About Canned Food? I have gotten the BPA (Bisphenol-A) question so many times from readers, that I thought I would try break it down and make it super simple for you to decipher plastics and the BPA question. When buying new plastic items, look for BPA free on the label. In my opinion, you should try to avoid buying plastics as much as possible and stick with glass or stainless steel containers. When looking at your old plastic items at home, you will find your answer as to what is safe to use posted right on the bottom of your plastics. On the bottom of your plastics, you will see a recycling symbol with a number inside. 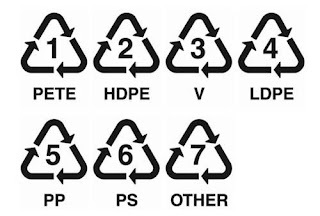 If you are old like me, it might be challenging to see the tiny, triangular recycling symbol, but grab a bright light or a young set of eyes and look for the symbols like the ones above; sometimes you may just see a number on older items. Numbers 2, 4 and 5 should be safe as they are plastics made with polyethylene or polypropylene. Plastic water bottles are labeled #1 and are made with Polyethylene Terephthalate, also marked as PET or PETE. According to Trusted MD.com, it is NOT recommended to re-fill plastic bottles made from #1 plastic. According to me, you should "just say no". For baby bottles, try to stick to glass (good luck finding them) or #2 HDPE. Toss out plastics with the numbers 1, 3, 6 and 7. Stay vigilant and get rid of items that have no number posted and certainly get rid of old, questionable plastics; including those old plastic, kitchen utensils like mixing spoons and spatulas you have had forever. Your vigilance for staying BPA free must continue into a concern over your canned foods. In the December 2009 Consumer Reports Magazine., an article appears which reports their findings on BPA in canned foods. Consumer Reports found BPA in almost all of the 19 name-brand canned foods they tested; including Similac Advance infant formula and canned Juicy Juice. Canned organic foods did not have less BPA than non-organic and the cans labeled "BPA free" even contained some of the chemical. The problem is with the lining of the cans which contain BPA. Try to stay away from as much canned food as possible or you can subscribe to Consumer Reports and take a look at the study for specifics. You can see a summary of the report HERE. Let's remember that BPA has been restricted in Canada and some US states and municipalities. It's really awful stuff which according to the CDC, has made it into 92% of the US general population. BPA has been linked to breast and prostate cancer, type-2 diabetes and cardiovascular disease in some studies. In June of 2009, the Endocrine Society released a statement, warning of the health threat of BPAs. Part of the statement called for the US Government to begin a public awareness campaign to inform the public of the risks and potential risks related to the presence of EDCs (Endocrine Disrupting Chemicals such as BPA) in the environment and in the food supply. I haven't seen those yet, have you? Over 200 animal studies have linked low levels of BPA exposure to brain damage and hormone disruption. Only a handful of studies have shown that BPA at low levels is safe...and who do you think funded those studies? Can you spell C-H-E-M-I-C-A-L-I-N-D-U-S-T-R-Y? Plastics are really hazardous in one's health, they even the main source in the depletion of our ozone layer when they are burned. Thank you for sharing your thoughts. Nice post! Thanks Bryan. Hope all is well with you. Just trying to get the word out. We should reduce the usage of plastic if we want to save our world. There are a lot of better alternative than plastic so we should go for them instead of plastic. Michael you are right. Now the news is that children and pregnant women should not be consuming foods from canned goods as the lining of the cans has BPA.